So another report has come out about corruption in Vladimir Putin's inner circle. Truth told, they're all beginning to blur into each other. It's almost become a ritual. The "shocking" report. The attention-grabbing headlines. (The Property Manager And Putin's Friends.) The Kremlin's denunciation of an information war by the West. And then? Nothing. The corruption of this regime has been well documented -- in Russia and in the West and in ways big and small -- for years. But allegations that would bring down any Western government, and even some non-Western governments, just doesn't ever seem to resonate with the Russian public. Part of this is cynicism. Corruption is part of the fabric of Russian politics and most people just accept this. Part of it is propaganda. The Kremlin has successfully dismissed these reports as foreign attacks on Russia. And part of it is nihilism. There is a belief among Russians, encouraged by the regime's spin masters, that every government is corrupt and theirs is no different. But with the economy deteriorating, you have to wonder when people will begin to get angry at the kleptocracy that governs them. Or if they ever will. The Russian Embassy in London has expressed "surprise" over British Foreign Secretary Philip Hammond's remarks this week that Russia is a threat to the world. A Russian journalist has been found dead of stab wounds in St. Petersburg. Moscow has promised an "asymmetric response" to NATO's military buildup in Eastern Europe. Russian and Serbian foreign ministers meet in Moscow. Russia's Supreme Court is holding a hearing on a challenge to a European Court ruling. The Security Council is considering a proposal to make the Federal Migration Service and the Federal Antinarcotics Service part of the Interior Ministry. I did today's Daily Vertical on liberal politician Leonid Gozman's remarkable comments on Russian television in which he said Russia was responsible for a war in eastern Ukraine that has killed thousands of people and that as a citizen of the Russian Federation, he bears responsibility for this. Before being shouted down by guests, Gozman also called on Vladimir Putin to release Ukrainian military pilot Nadia Savchenko and appealed to Ukrainians, saying that all Russians do not support the "barbarism and cruelty" that Moscow has unleashed on their country. So now we know what Kremlin spokesman Dmitry Peskov was probably talking about when he said the Western media is preparing an "information attack" on Vladimir Putin and his cronies. Separate reports by Reuters and the Organized Crime and Corruption Reporting Project (OCCRP) look at the activities of Grigory Baevsky, a 47-year-old business associate of Putin's judo partner Arkady Rotenberg. "Baevsky not only helped Putin handle some of his most delicate personal situations but also made a fortune from questionable deals with the Russian state," according to the OCCRP report. And Reuters noted that he "provided properties to multiple women who share one common theme: President Vladimir Putin." Vladimir Putin's absence from this week's nuclear summit in Washington is raising eyebrows. John Herbst, former U.S. ambassador to Ukraine, has a piece in The National Interest titled How Russia Undermines Nuclear Security. And Foreign Policy has a report on: U.S.-Russia Tensions Jeopardize Effort to Lock Down Loose Nukes. New charges have been filed against the director of the Library of Ukrainian Literature in Moscow that could land her a five-year prison sentence. Natalya Sharina initially faced charges of "extremism" and "incitement." But those charges have been dropped and she is now being charged with misappropriating 1.4 million rubles of state funds. The new charges were first reported by LifeNews, which is widely reputed to have ties to the security services. The funny thing about April Fools' jokes in the Russian media is that, lately, it's difficult to tell if they are true or not. Case in point: This "report" in Gazeta.ru about how Moscow is exploring the legal possibilities of reclaiming Alaska from the United States. They actually had me for a few seconds -- which is a sign of the times. The White House announced that it will provide Ukraine with $335 million more in "security assistance" after a meeting on March 31 between U.S. Vice President Joe Biden and Ukrainian President Petro Poroshenko. The aid is badly needed as Ukraine has faced an acute economic crisis since Russia annexed Crimea in 2014 and fomented a separatist revolt in Ukraine's east. While Washington supports Ukraine's pro-Western government, it has been concerned about corruption in Kyiv. Those concerns were addressed in part earlier this week when Ukraine's parliament sacked the country's chief prosecutor, who allegedly was stalling high-profile corruption investigations. The White House said Biden told Poroshenko that more aid will come if he keeps up efforts to install a new reform-minded government. "The vice president welcomed the efforts...to form a stable, reform-oriented government, and stressed that this step, as well as the enactment of needed reforms, are critical to unlocking international economic assistance, including the third $1 billion U.S. loan guarantee," the White House said. The United States and NATO are switching their defense policy from assurance to deterrence in Eastern Europe, according to commander of U.S. European Command Gen. Philip Breedlove who spoke in the Latvian capital Riga Thursday, Defense News reports. Breedlove commented this way on Pentagon’s intentions to deploy an additional 4,200-strong armored brigade in Eastern Europe in 2017 in a response to Russia’s foreign policy in the region, according to Defense News. “We are prepared to fight and win if we have to ... our focus will expand from assurance to deterrence, including measures that vastly improve our overall readiness,” Breedlove said following talks with Baltic region NATO commanders. But the new U.S. deployment avoids the issue because it is not technically permanently stationed in Eastern Europe, with brigades rotating in and out, U.S. officials say. From April 4 to April 9, the command of the 2nd Army Corps of the Armed Forces of the Russian Federation are planning provocative attacks on the Ukrainian army leading positions and civilians in the settlements close to the demarcation zone under the guise of military drills, according to the Main Intelligence Directorate of the Ukrainian Defense Ministry. "The plan is to carry out armed provocations against the Armed Forces of Ukraine in order to accuse the Ukrainian side of violating the Minsk agreements and the international humanitarian law. The provocations will be led by Commander of the 2nd Army Corps Armed Forces, Major-General Yevgeny Nikiforov," the report says. According to the collected intelligence, in order to divert the attention of the OSCE monitors, the occupation forces are planning to conduct simulation of military drills of the 2nd separate motorized rifle brigade (Luhansk) with the participation of the commander and mediators from among the commanders of units and formations near the villages of Shymshynivka and Uspenka. Prime Minister of Ukraine Arseniy Yatseniuk has declared UAH 1.966 million of gross income for 2015, whereas in 2014 his total revenues amounted to UAH 1.147 million. According to the premier's declaration posted on the government's website, his wage totaled UAH 81,700, interest on bank deposits UAH 1.2 million, income from property lease UAH 600,000, as well as other income UAH 44,200. The total income of premier's spouse Terezia Yatseniuk for 2015 amounted to UAH 1.134 million, including UAH 802,400 of business income and UAH 331,600 in interest on bank deposits. The declaration also indicated military bonds in the amount of UAH 100,200, which the prime minister acquired in 2014. The property of Yatseniuk includes a land plot of 3,031 square meters, a house and a garage with a total area of 343.5 square meters, three apartments with a total area of 342 square meters (two apartments in Kyiv and part of an apartment in Chernivtsi), a garden house of 114.5 square meters, a parking place of 13.4 square meters in Kyiv. The premier owns a 2010 model of Mercedes S, his wife a Range Rover of a 2012 model. As follows from the declarations, the Yatseniuk family did not acquire any new property or cars in 2015. Ukrainian President Petro Poroshenko's meeting with U.S. President Barack Obama on the sidelines of the Nuclear Security Summit in Washington, D.C., gave special attention to the need to establish Ukraine's reform-oriented coalition and government. "President Obama confirmed the readiness to extend the third tranche of loan guarantees in the amount of $1 billion upon completion of the process to form a government in Ukraine," the Ukrainian leader's press service reported on Friday. The two presidents also discussed the situation in Donbas and coordinated their efforts to secure the full implementation of the Minsk agreements, the press service said. Among other topics, Poroshenko and Obama spoke about ways to further promote the strategic partnership between Ukraine and the United States, it said. Frunze Plant (Kharkiv), the leading Ukrainian manufacturer of fencing systems, first entered the Austrian market after shipping a batch of punched screens for Austria's Fa Biokorn. The company said in a press release on Friday that the punched screens are of innovative design made jointly with Kharkiv National Technical University of Agriculture. The screens are made for screening buckwheat. The holes are epicycloidal instead of triangular. The solution helps increasing screening efficiency by 40%. The press service said that Frunze Plant is the world's only producer of these punched screens. Fa Biokorn bought a test batch and the contract could be signed after the tests. Frunze Plant, founded in 1885, produces screens for agriculture machinery, flooring grills, netting and fencing systems for the construction industry, elements of urban environment (waste baskets, benches), storage racks and others. UKRAINE’S efforts to reach an association agreement with the European Union have led to revolution, poisoned relations with Russia and caused war with Russian-backed separatists. After years of negotiations, Ukrainian and EU leaders at last signed the agreement in Kiev in March 2014, just after the Maidan revolution. But the deal may yet founder in a surprising place: the Netherlands. Dutch Eurosceptics have forced a plebiscite on whether to ratify it. The EU’s other 27 states have already done so; the Netherlands is the lone holdout, and most polls show that on April 6th “no” will probably win. The referendum is not binding, but the Dutch government will have to respond to the outcome. Rejection would hobble European diplomacy and suggest that the EU is too fractured to maintain a common foreign policy in the face of Russian interference in Ukraine. And it would send a signal to Ukrainians that however much they want to be part of Europe, many Europeans want no part of them. The campaign to block the association agreement began last summer when GeenPeil, a Eurosceptic social-media group, selected the issue as a test of the referendum law, which came into force on July 1st. It quickly gathered 470,000 online signatures, far more than the 300,000 needed to force a vote. Since the referendum was announced, it has transformed into an active campaign group, using volunteers to ensure that turnout reaches the 30% needed for the result to be valid. Opponents of the Ukraine agreement regard it as forcing them into an alliance with a corrupt country requiring billions of euros in aid. Though it is largely a trade deal and does not allow Ukrainians to work in the EU, many Dutch, ignoring reassurances from the likes of Mark Rutte, the prime minister, regard it as a step towards EU membership and fear losing jobs to low-wage Ukrainians. “There’s a lot of distrust,” says Frank van Dalen, a political consultant who is working with GeenPeil. The referendum is, he says, one of the few ways for Dutch citizens to feel that “at least for once we have some control”. The opposition is all the more remarkable, given that the Netherlands has suffered more than anywhere else in the EU from the Russian-backed war of secession in Donbas. In 2014, 193 Dutch passengers were killed when flight MH17 was shot down over Ukraine, most likely by Russian-backed rebels. 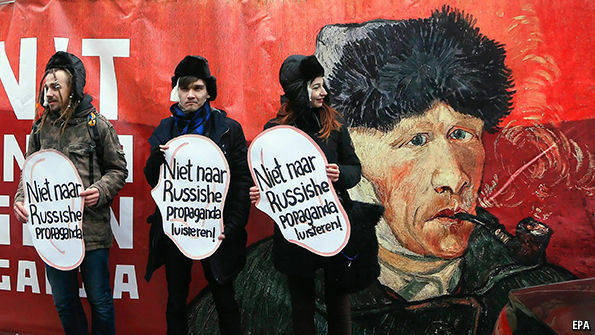 A furious Dutch public firmly supported EU sanctions against Russia in response. But the referendum campaign has become a forum for those who mistrust the official Dutch government inquiry into MH17, or who subscribe to conspiracy theories about the crash’s cause. Others say the association agreement itself caused the Ukrainian conflict, and hold the EU to blame. “It’s a very bad scheme that we’re imposing on a country where we’ve either bought or brought oligarchs into our camp by false promises,” says Thierry Baudet, a prominent Eurosceptic. In his telling, Ukraine remains divided between pro-Russian and pro-European regions, and it was the West’s promises of EU membership that led to the violence. Trade with the EU, he argues, cannot make up for the loss of economic ties with Russia, which in any case is open to a three-way deal; the idea that Ukraine must choose between Russian or EU spheres is “a spin that Eurocrats have been imposing on us, reinforced by the Americans”. In fact it was Russia that ejected Ukraine from its customs union, annexed Crimea and supported separatists in Donbas. In recent decades Europe has been as important a market as Russia for Ukraine, and with exports to Russia now collapsing, the turn towards Europe was inevitable. But even though the “no” camp’s claims can be refuted, focus groups convened by supporters of the trade agreement demonstrate that such factual arguments cannot win the referendum. Instead, the “yes” side is concentrating on one message that did show promise: that to block the agreement would be to give Vladimir Putin, Russia’s president, just what he wants. On the evening of March 30, an opinion piece written by Vladimir Markin, the spokesman for Russia's Federal Investigative Committee, appeared on the news website Vecherny Chelyabinsk. In the text, Markin discusses the West's information war against Russia, and argued that only unstable people support the Ukrainian soldier Nadiya Savchenko (sentenced last month to 22 years in a Russian prison for aiding in the murder of two journalists), though he allows for her possibly being exchanged for some “good, honest people now confined in Kiev.” He also mentions a “Secret Thousand-Year Plan” to revive Russia. On Twitter, Markin wrote that Vecherny Chelyabinsk was “the only news outlet brave enough” to publish his text. As it turn out, the article also disappeared from the Federal Investigative Committee's own website, where it had been republished. And then, as suddenly as everything had vanished, it all reappeared. The text is back up at Vecherny Chelyabinsk and the Investigative Committee republished the article a second time. When the president's press secretary warns the public that some event in the public space is being prepared in the next few days, it means that he's acting like a professional and using the tools at his disposal. With Mutko and his announcement, we'll have to see how that case develops. For now, his statements are just evidence that his PR team is trying to get the situation under control. The tactic itself of forecasting shocking events is nothing new. It's been a feature of Russia's communication space since the 1990s. As I recall, Gleb Pavlovsky was one of the first political analysts to use this technique, when he was still working for Boris Yeltsin's team. He was thought to have authored newspaper articles under pseudonyms that announced information attacks before they hit and political changes yet to be unveiled. But, of course, none of this looked as outright as it does today. Another similar case is the recent controversy surrounding tennis star Maria Sharapova [who held a press conference admitting that she took the banned drug meldonium]. Personally, I think that was some brilliant PR work. She went right into crisis mode, and she handled the situation. The Federal Road Transport Agency says roads with smooth riding surfaces enable drives to break the speed limit more often, which may be leading to an increase in road traffic collisions. The agency is citing a study it conducted using figures for 2015. “Improving the transport and operating condition of federal roads often leads to an increase in accidents in some areas. On a good road, drivers often exceed the speed limit and venture into the oncoming lane. These infractions are among the most frequent causes for road accidents,” the study concludes. At the same time, the transport agency notes that in 2015 the number of highway collisions overall decreased by 11 percent and road fatalities dropped by 15 percent. Following Yanukovych’s ouster, Ukrainians trusted Petro Poroshenko with their future giving him 54% of the national vote. Two years after the revolution it appears much of the initial faith and enthusiasm have led to a degree of unexpected disenchantment. “Ukraine will definitely not be able to become a member of the European Union in the next 20 to 25 years, and not of NATO either.” European Commission Chief Jean Claude Juncker, March 3, 2016. In his blistering speech at The Hague, Juncker underscored to Dutch voters that this year’s free-trade agreement between Ukraine and the EU would not represent a first step toward joining the politico-economic union of 28 member states. The European Commissioner’s sentiments likely dashed the hopes for many Maidan protesters who braved the cold winter in Kyiv two winters ago, which led to the subsequent resignation of Viktor Yanukovych, the pro-Kremlin Ukrainian president. “Maidan’s our big hope for a better life,” Tetyana Gomon, a wide-eyed 36-year old piano teacher explained at the time of the protests. “And this hope gathered [throngs of] people every day and night… at the Square of Independence for three months in freezing temperatures…” After the violent protests in February 2014 ended, Yanukovych and many other high government officials fled the country. One of the main reasons protesters endured the harsh wintry climate was their indomitable commitment to stand up to Yanukovych’s increasingly authoritarian rule of law, abuse of power and his deliberate methods of centralizing political corruption. Following Yanukovych’s ouster, hopeful Ukrainians who had been gearing for revolutionary change remained enthusiastic all through the presidential elections, which saw Petro Poroshenko receiving 54% of the national vote. Two years later, however, it appears much of the initial faith and enthusiasm for a peaceful revolution and the fruits of democracy have led to a degree of unexpected disenchantment. This level of disappointment has been exhibited largely by a stalemate with the citizens’ standard of living. It remains the same as during the Yanukovych reign, and Ukraine is far from achieving necessary reforms for a true democracy. The Chocolate King, as President Poroshenko is sometimes cynically known as for his oligarchic past, has not kept his promise to relinquish his previous business ventures, which made him a billionaire. The chasm has only widened between the wealthy and the average Ukrainian. Oligarchs like Rinat Akhmetov and Igor Kolomoisky remain as powerful as they have been in the past, and the economic system also has proven to be corrupt and inefficient. It remains beholden to the International Monetary Fund for loans, especially in the last nine months. Above all, peace has not come to the volatile East region where pro-Russian separatists continue to quarrel with Kyiv’s forces. The Minsk Agreements have largely failed. In February 2015, at a 2-day summit, leaders of Ukraine, Russia, France, and Germany signed on to a package of diplomatic measures in hopes of alleviating the ongoing war in the Donbas region. The talks were overseen by the Organization for Security and Cooperation in Europe (OSCE). Last August, while meeting with Juncker, Poroshenko stressed that Russia needed to abide by the Minsk agreements and to immediately implement a ceasefire. “Minsk – III cannot happen. We have the Minsk agreements and it is necessary [for Russia] to fulfill them. The meetings were among other things devoted to the fact that Russia [has not] respected its own commitments,” declared Poroshenko. “The support of the EU is essential for us. War and Russian aggression against Ukraine are not the reasons for avoiding reforms. As President, I firmly stand on the position of an effective continuation of reforms,” he added. The violence in the East has led to squabbles domestically. The ruling coalition formed after the parliamentary elections last October broke down following a series of misunderstandings on all sides. This dissension led to Poroshenko asking for the resignation of Prime Minister Arseniy Yatsenyuk since he lost the support of his coalition. Later, that same day, however, the Ukrainian parliament voted the cabinet’s work as unsatisfactory but rejected a call for a vote of no confidence. It was announced on Tuesday that Ukraine’s three major parliamentary parties agreed to form a new coalition and nominate parliamentary speaker Volodymyr Hroysman to be the country’s new prime minister, as reported by Reuters. This deal is said to potentially quell some of the domestic political unrest of recent months, which has included new corruption allegations, which stymied reforms demanded by the West and derailed negotiations for a new $1.7 billion loan from the IMF. Hroysman is a 38-year-old former mayor and an ally to Poroshenko. Some Maidan supporters like V. Liagushko, an Ukrainian &#233;migr&#233; in the U.S., however, does have some degree of sympathy for Poroshenko’s arduous responsibilities. “The situation he has is a difficult one and it is in the best interest of Mr. Putin to paint Poroshenko with the wide black brush [in order] to further destabilize the situation in Ukraine,” she told us. Some of Ukraine’s newly minted fears remain that withdrawn Russian forces in Syria could be redirected to the East to fight Kyiv’s army. During the 2008 NATO Summit, Russian President Vladimir Putin made a rather telling remark: “If Ukraine joins NATO, it will be without Crimea and the East,” Putin ominously said. Sure enough, Putin’s guarantee was fulfilled in March 2014 as Russia annexed the Crimean Peninsula. Bulgaria, a former communist country like Ukraine, had a better chance to join NATO and the EU before Putin grew stronger with his territorial ambitions, and his overall mission to restore the vaunted Russian empire. Putin has only felt emboldened in the past few years as he continues to exert the Kremlin presence on former countries of the Soviet Union. Aside from confronting Putin’s Russia, disillusionment persists in Ukraine, as the chasm between its society and government appears to be growing. “The world changes and recent events [may] give Ukraine the hope that its situation will not freeze as it did in Georgia, Moldova and the former Yugoslavia,” Belousov reminds us. Jared Feldschreiber chronicles press freedom cases, ambassadors and dissidents. He also writes cinema and theater analyses, is a published poet, and continues to pursue his film projects. Anguelina Piskova is a working journalist with Bulgarian National Radio since 2000 where she serves as news anchor and editor, largely dealing with foreign affairs. She covered Ukraine’s 2014 presidential and parliamentary elections. Ukrainian ornaments have always had two functions – ensure protection (oberih) and information. Amulets and ritual jewelry – rings, bracelets and crosses – were worn close to the skin. Ornaments worn over clothing testified to the owner’s wealth – six strands of coral beads could cost as much as a pair of oxen. We look more closely at the design of these ornaments to understand why and when they were worn by our grandmothers and ancestors. Gerdan – two long strips of beaded patterns joined by a medallion which lies on the wearer’s solar plexus (an important power chakra). They were worn by both men and women. In Bukovyna, a small mirror dangled from the ends of gerdan ornaments. Sylyanky or pletinky – parallel lines of beads tied behind the neck. The name comes from the manufacturing process (sylyannya – way of stringing beads). Women wore narrow sylyanky (two to three centimetres) every day as a talisman (the power of each sylyanky was determined by the intricacy of its design). Hutsuly (Carpathian mountain people) sewed these beaded talismans onto red canvas ribbons. The traditional beaded designs were shaped like geometric diamonds with simple or complicated contours, triangles branching out at the corners, zigzags and curved lines – symbols of infinity. Zhardy – metal necklaces consisting of two or three strands strung on a red or metal base of crosses. Two discs connected the two ends behind the neck – cheprahamy, which are larger than the crosses on the necklace. The cheprahamy are covered with solar symbols – a wheel with four, six or eight spokes (the modern version is a cross), a rosetta or concentric circles. Patsyorky – glass beads. Craftsmen used smalt – an opaque alloy of different coloured glass – dark blue, turquoise, white, green, brown, black and red. Round beads were encrusted with gold and decorated with bright-coloured inks. Dukach (lichman) – pectoral shaped like a medal-like coin with a metal bow decorated with stones. It was a central piece of breast ornaments. It was pinned in the middle of many strands of beads. The face of the most ancient dukach shows the “portrait” of a person who hired Ukrainian Cossack warriors, and the reverse side shows the battle scene in which the person took part. Dukachi with Biblical scenes were very popular. One of the oldest Ukrainian symbols is the head wreath woven from grasses and flowers and decorated with bright ribbons. There can be up to 12 different flowers in one wreath. Each flower or grass means something: roses stands for love, lilies are symbols of purity and innocence, cornflowers – simplicity and modesty; heathers – independence, field bells – gratitude, laurels – success and fame; hollyhocks – beauty and coldness, peonies – longevity, daisies – peace and tenderness, immortelles – health and guelder roses – symbols of maiden beauty, the symbol of Ukraine. The vinok was always decorated with different coloured ribbons, which were cut lower than a girl’s braids in order to hide them. The central ribbon was usually light brown, symbolizing the land and soil, then came yellow ribbons, symbolizing the sun, followed by light green and dark green – beauty and youth, light blue and dark blue – sky and water, which give strength and health, orange, symbolizing bread, violet – wisdom, crimson – truth and sincerity and pink – prosperity. White ribbons were intertwined only if they were embroidered with silver and gold (the sun on the left side of the vinok and the moon on the right). Non-embroidered ribbons were not added to the vinok as they commemorated the dead. Girls used red ribbons to intertwine poppies into their wreaths – symbols of grief and magic. Orphans wove blue ribbons into their hair and wreaths. People bestowed lavish gifts, bread and money on young girls wearing these decorative head wreaths and wished them happiness and prosperity. The girls, in turn, expressed their gratitude by giving them a ribbon from their wreath. Last edited by Hannia; 2nd April 2016, 05:35.